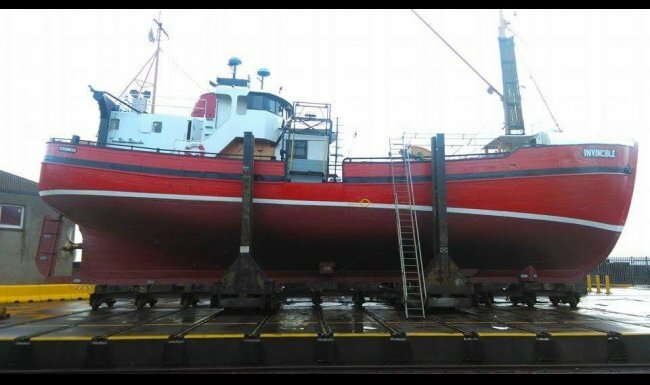 In March we headed down to Fraserburgh for our annual refit.. With her red shiny hull and white casing painted in the whitest of white ready for a great season ahead. With a full spring clean top to bottom M.V.Invincible is now looking the best she has ever looked. New Aluminium hand rail on the top casing to replace the old black bar rails. Plumbed in the back up water pump with check valves so if there's a problem the it's just two valves and a switch and we're back in business. Two new windows fitted to the Port side of the casing in the mess. if you would like to see more pictures please visit our 2017 refit gallery.